A softer, more comfortable night splint for morning heel pain! Our Sock Night Splint provides the same relief as a traditional Night Splint, but is far more comfortable and easy to wear. 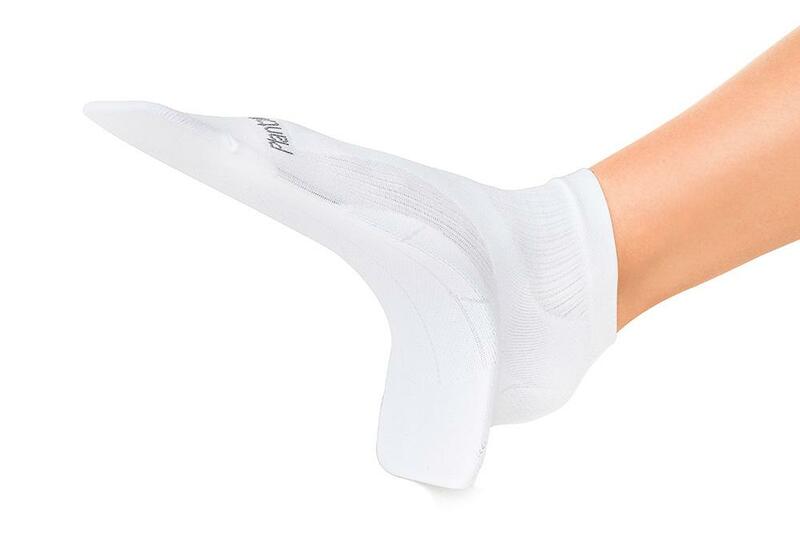 Slip it on in seconds and it holds your foot in a stretched position, providing morning plantar fasciitis relief. Sock Night Splints are sold one in a pack (1). The Sock Night Splint provides relief for plantar fasciitis and morning heel pain. Unlike traditional night splints and braces, our Sock Splint is lightweight and comfortable to wear, made from soft materials. They do not involve a bulky boot, Velcro straps, or pulling on the toes, but instead stretch the plantar fascia ligament with a lightweight plastic splint. This soft Night Splint is easy to use, keeps your feet cool, and provides a soothing stretch to the arch by applying pressure upward into the arch throughout the night. This puts the plantar fascia ligament in the ideal position, providing morning plantar fasciitis relief. We are so confident you’ll love your Sock Night Splint that we offer a 100% guarantee. If you aren’t a fan of night braces or night splint boots, but want the same effective morning pain relief, this soft Sock Night Splint is perfect for you.